You’ve been sailing on the high seas for weeks now, and finally, you’ve reached port. It’s been a long voyage under the blistering sun, and you've endured wicked waves and winds that nearly capsized your ship. But you’ve made it! That’s great news! The first thing you should do is change into something a little bit more comfortable, put your feet on solid land, and find yourself some rest and relaxation. 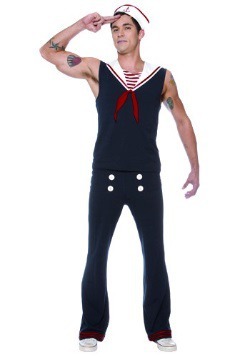 Our suggestion: throw on this Women’s Shore Thing Sailor Costume and get yourself some fresh grub! It’s important, when you have shore leave, to vary up your diet with some fresh fruits and vegetables, but also to make sure everyone knows your heart is still on the open water. That’s what is so great about this look. It shows that first and foremost, you’re a master of the deep blue, and second, that you’re here to have fun and relax! This dressed-down outfit is perfect for enjoying the sunny shores of any port city! The sleeveless dress features a built-in petticoat, and the attached bodice features a sailor collar with gold braid trim and a striped satin inset. 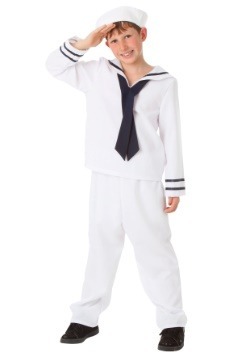 The solid satin skirt also has gold trim and a sequined anchor applique. 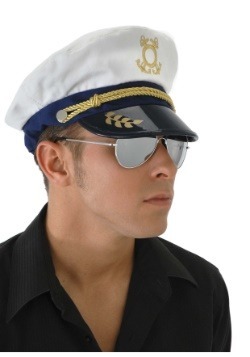 The included sailor cap has two strips of gold braid around the brim, as do the satin wrist cuffs. Finally, to complete the ensemble is a satin belt that can be tied as desired. Don’t forget some fun footwear or maybe a bathing suit just in case you get time to run down to the sandy beaches for a quick dip! Shore leave is always a quick stop (sometimes too quick), and before you know it, you’re headed out again to explore the mysteries of ocean life. 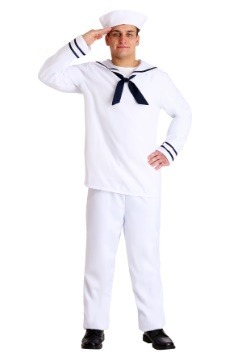 But at least you got to relax a little and have some fun in this nautical themed look!